I would have liked to pick a GNR from my neighborhood, but seeing as my neighborhood is Hyde Park, the less said about that the better. So I have picked a place close to my neighborhood that, since reading about here a few months ago, I've visited close to a dozen times. That place is Barbara Ann's. I wish that I could say I've explored the menu top to bottom, that is not the case. In the debate between Lem's and BA's hot links, mark me down in the BA's column. I love the big chunks of pork and fat that this encased meat contains. Ordering the links well done is a critical step, the extra time on the smoker renders out more of the fat and the flavor of the meat that is left behind gets more concentrated. An excellent nomination, UB, and one I can heartily second. It makes me pine for south side bbq expeditions of yore. dicksond wrote: An excellent nomination, UB, and one I can heartily second. It makes me pine for south side bbq expeditions of yore. And I heartily third. Barbara Ann's links, dipped sparingly in their sauce, is a taste/texture/flavor combination that's hard to beat. Tips ain't bad either. I'd like to propose Barbara Ann's for an LTHForum GNR renewal. Yes, Mack the former pitman has moved on to his own place, Uncle John's, which is terrific and a sure contender for the next round of GNR nominations, but even without Mack Barbara Ann's, which was started by Barbara Ann's father in 1967, is GNR worthy. 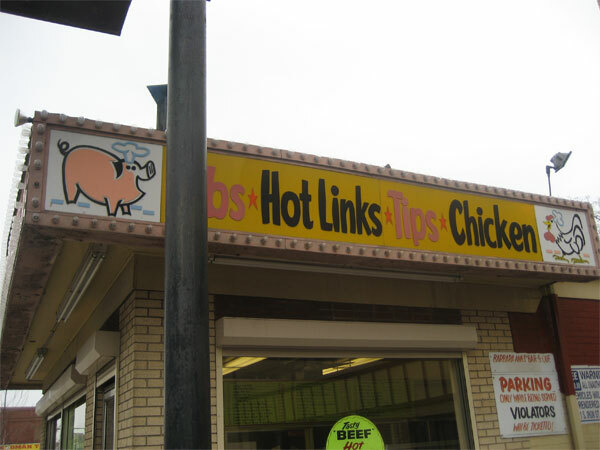 When asked last summer (2006) to do a Slow Food BBQ Tour it was without hesitation I included Barbara Ann's with Honey One, Lem's and Uncle John's, it was, and remains, in my Top 4 Chicago BBQ joints. One of these days I have to create a slideshow of all the representations of pigs on Chicago restaurant and grocery signage. Anyway, ordered ribs and hot links, followed Your Pal Will's wise suggestion of a mix of mild and hot sauce, didn't see where, if anywhere, it said to get sauce on the side since the food was absolutely swimming in sauce in the styrofoam package, the fries were basically patatas bravas. There's nothing menacing about 76th & Cottage Grove in the middle of the day, but nothing especially charming about it either, the concept of a BBQ shack with an attached motel is more interesting than the reality, so I decided to zip back north about a mile and a half to one of my favorite sights/places/things in all Chicago, Lorado Taft's epic sculpture The Fountain of Time, on the Midway Plaisance. 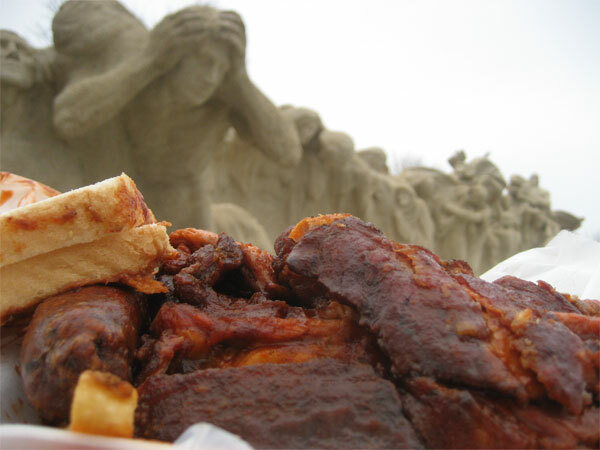 Here I was actually menaced-- by geese-- but still had a pleasant, Thomas Gray-like lunch contemplating Taft's subject, eternity, while eating the sort of meal likely to bring one closer to it: rib tips, hot links and French fries. So how was the 'Q? the mute, struggling, despondent figures of Taft's masterwork ask. They shall never taste it, but still they wish for some report from the living. I liked the "Uncle John's" links better than my one other taste of them (when Honey 1 cooked some up), the quarter-inch chunks of fat are still alarming, but these hot links have their own unique style, a porky sausage pop mixed with a hint of breakfast sausage from the visible bits of sage in the mix, different and more interesting than the usual polish sausage-like link. The rib tips seemed very much like Honey 1's, smoky and a little leathery-chewy, which I'm all for. Sauce is too much for me-- too much sugar, too much paprika, I'd get it on the side next time and dip sparingly. Honey 1 dials a similar style down to a point I prefer. But all in all, a worthy meal, an exemplar of the Chicago style (like it or not, versus Memphis or KC or whatever, this is exactly what it is), a friendly spot, and well worth a renewal of its Great Neighborhood Restaurants award. Sauce on the side, always, implied, axiomatic..........never a doubt, BBQ sauce without. Standard ordering technique at any and all BBQ joints. 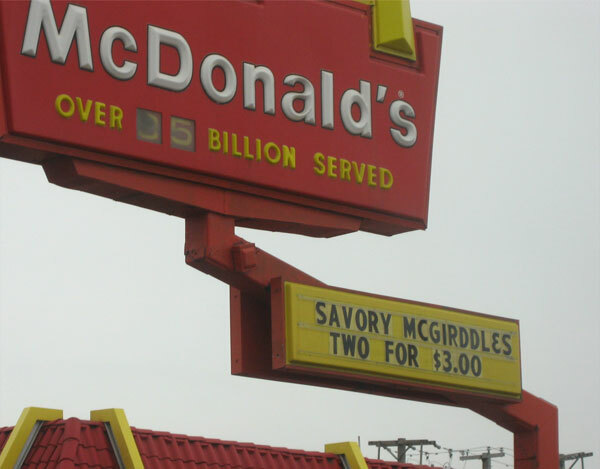 I'll have two full slabs, large tips and two orders of links, sauce on the side please. More on Barbara Ann's here. Still in the top echelon of Chicago BBQ, I support the GNR renewal. I've been a couple of times since my first trip a year and a half ago and count myself a big fan. The tips still aren't my favorite, but the links are awesome. The fried fish (simple, but expertly-fried, cornmeal-crusted catfish) is also really good, though not destination-worthy in and of itself. I'm definitely a supporter of Barbara Ann's as a GNR. If it were only closer to my house, the links would be in my regular dinner rotation. Was just there last night along with lots of others: still great food and friendly service. The people behind the plexiglass worked quickly and steadily to get us our rib tips the way we wanted. I noticed that a number of people ordered them chopped up small. They were also blending the sauces to the desired heat levels and checking to make sure that the order was correct. Definitely a GNR. The links! Love the place, the hardware, and the people. Heartily support renewal. Aquarium smoker, friendly people, tips, links and bullet proof glass. Toss in a motel and you have a can't miss spot on the Chicago BBQ trail. Solid yes to GNR renewal. Barbara Ann's, count me a fan! Stopped by Barbara Ann's on Saturday for a jumbo order of tips and a jumbo order of links. I just can't get enough of their links! Almost like a breakfast sausage with the sage and plump and juicy and delicious. The tips happened to be "on" on this visit, as well. Really tasty with the right texture. Definitely has my support for renewal. This place has been "on" again since the most recent conflagration. I continue to recommend, and will be there double now that UJ is shuttered.